Posted 28 August 2012 in General. 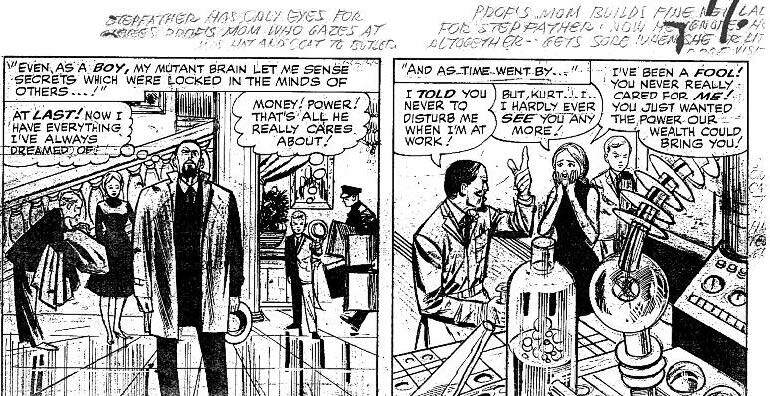 What Kirby is describing of his early experience here is a clear example of divergent thinking, one of the hallmarks of the creative genius personality (but more on that in a bit). 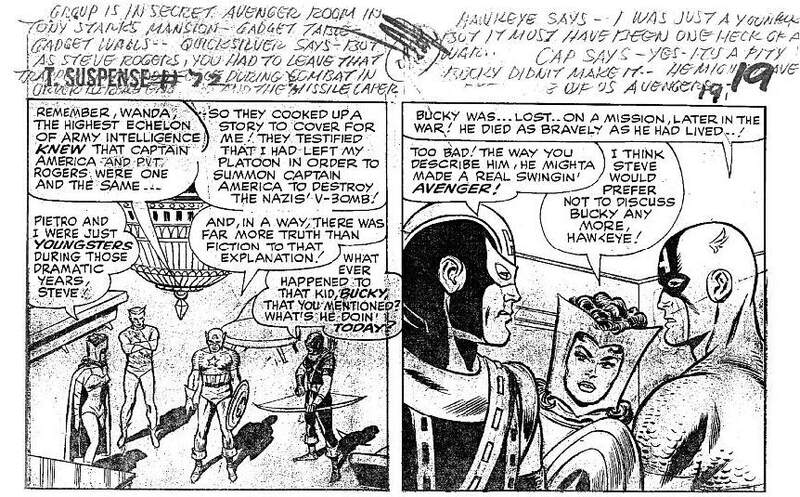 Brent Staples, in an article titled “Jack Kirby, a Comic Book Genius, Is Finally Remembered” published in The New York Times on August 26, 2007 wrote “Mr. 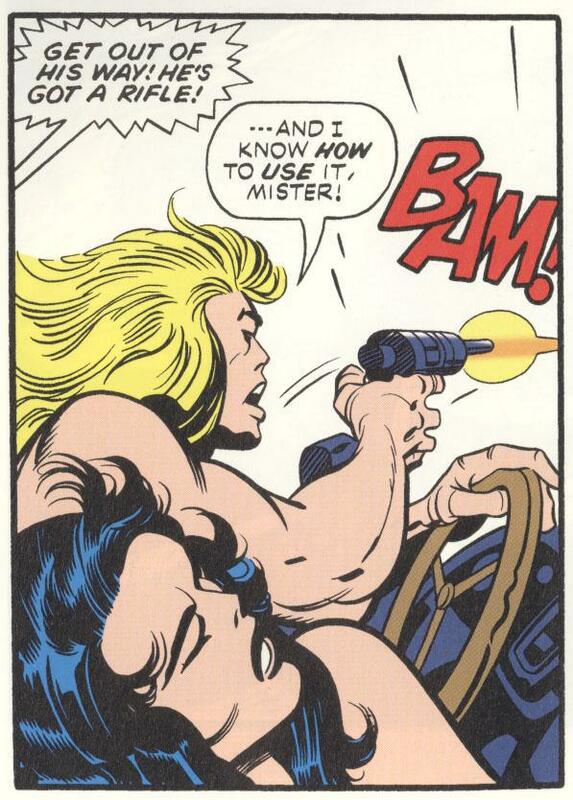 Kirby did a lot more than just draw. 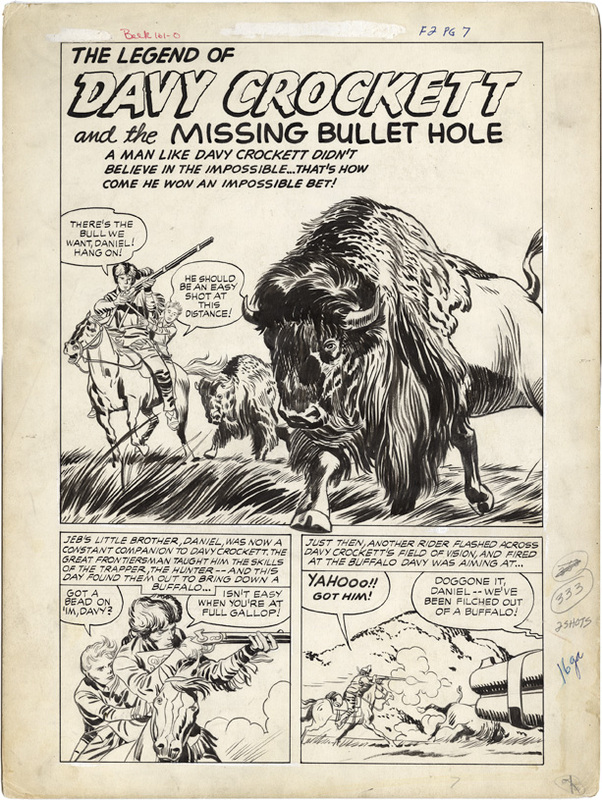 As the critic Gary Groth so ably put it in The Comics Journal Library, “He barreled like a freight train through the first 50 years of comic books like he owned the place.” He mastered and transformed all the genres, including romance, Westerns, science fiction and supernatural comics, before he landed at Marvel. For the record I believe ‘genius’ is one of the most overused and therefore devalued words in the English language. 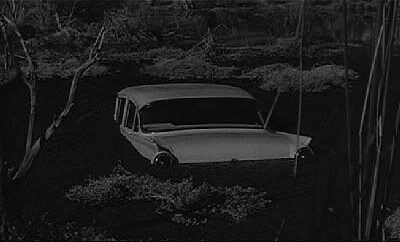 Just Google “The Genius of…” and add any name that comes to mind and you’ll see what I mean. Kim Kardashian? The Situation? (life & style; and comedy; respectively). Perhaps this has the makings of a new parlor game. While most agree that Albert Einstein fits the general conception of genius, when it comes to the creative arts there is no clear delineation. In the end it comes down to the definition of the word, which itself isn’t clear. One would think anyone with an IQ of over 160 would qualify for something other than Mensa membership, but that isn’t necessarily so. In fact, Merriam-Webster’s Dictionary definition doesn’t even mention a specific IQ score. c : a person endowed with transcendent mental superiority; especially : a person with a very high IQ. Still, the problem is, even the definition of “creative” is hard to quantify. It is that very individuality that helps us define genius, for it can thereafter be imitated. During the mid- 20th century, psychologists began studying creativity for the first time.3 And not surprisingly, this research yielded little concrete evidence of a strict definition of what it means to be creative or how creative personalities are formed. To be a creative person you had either a strict or liberal upbringing, did well or poorly in school, had lots of friends or none. A representative study conducted by the Berkeley Institute of Personality Assessment did yield some conclusions: “Creative architects” as distinguished from their less creative peers, exhibited a greater incidence of such personality traits as independence, self-confidence, unconventionality, alertness, ready access to unconscious processes, ambition, and commitment to work. This willingness to experiment arises from a temperament that’s seeks arousal, from sheer pleasure in working with the medium, from a confidence in one’s own emerging powers, and from the relationship between the ease in own artistic medium and difficulties with standard scholastic practices. If one cannot succeed where they are supposed to, one may combat personal frustrations by blazing a trail in one’s area of strength. The quality of the early years is crucial. If, in early life, children have the opportunity to discover much about their world and to do so in a comfortable, exploring way, they will accumulate invaluable capital of creativity on which they can draw in later life. If, on the other hand, children are restrained from such discovering activities, pushed in only one direction, or burdened with the view that there is only one direction, or one correct answer or correct answers that must be meted out only by those in authority, then the chances that they will ever become creative adults are significantly reduced. For every one child who decomposes music there are dozens who simply play as they are taught. Young musical performers, for example, often reveal their gift for composing by a constant effort to “rewrite a piece.” Often this adventurousness is interpreted as insubordination. There are individuals who overcome the intervention of authority to go on to become creative in spite of restrictions. If a chart would be created of what came before and after, each would qualify. 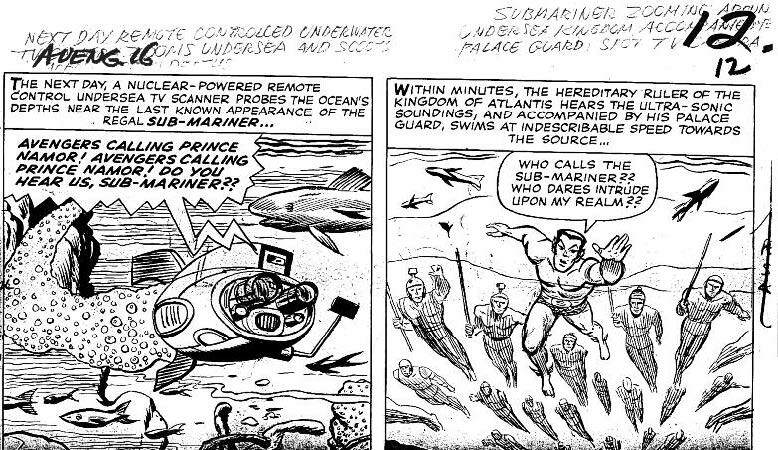 While we have no way of knowing how Jack Kirby would have scored on an IQ test, it doesn’t really matter. The fact is he transformed his field from the moment he entered it, and unlike many other accepted geniuses, continued to do so for the next 35 years. Consider that Einstein’s breakthroughs occurred when he was still in his 20s. 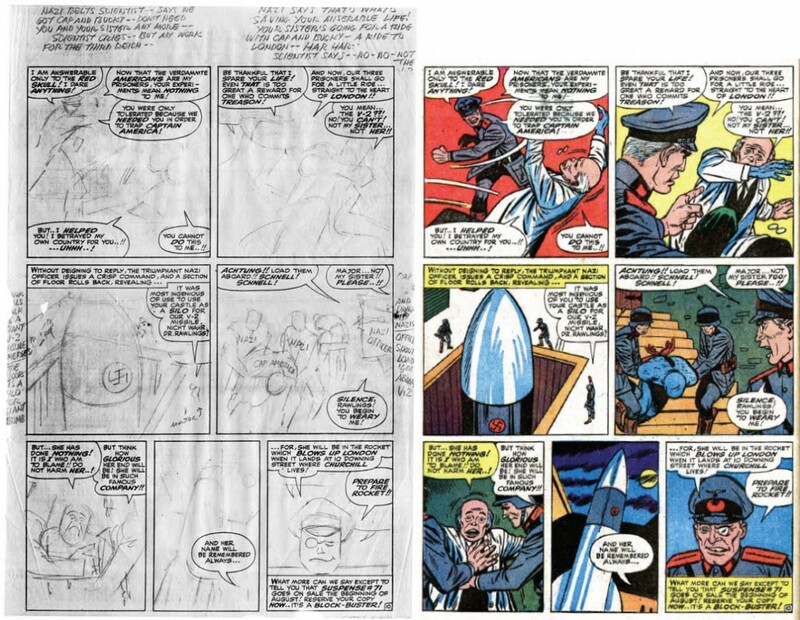 What I am submitting is that Kirby was a creative genius, one that changed the way comic storytelling was approached going forward. The closest comparison I can draw is that of Louis Armstrong. While Armstrong did not create jazz, he was there as it emerged. Whilst he recorded in tandem with others throughout his career (King Oliver, Ella Fitzgerald, Jack Teagarden, et al) his singularity always shown, and he managed to influence jazz and popular music for every decade from the ’20s till the ’60s. 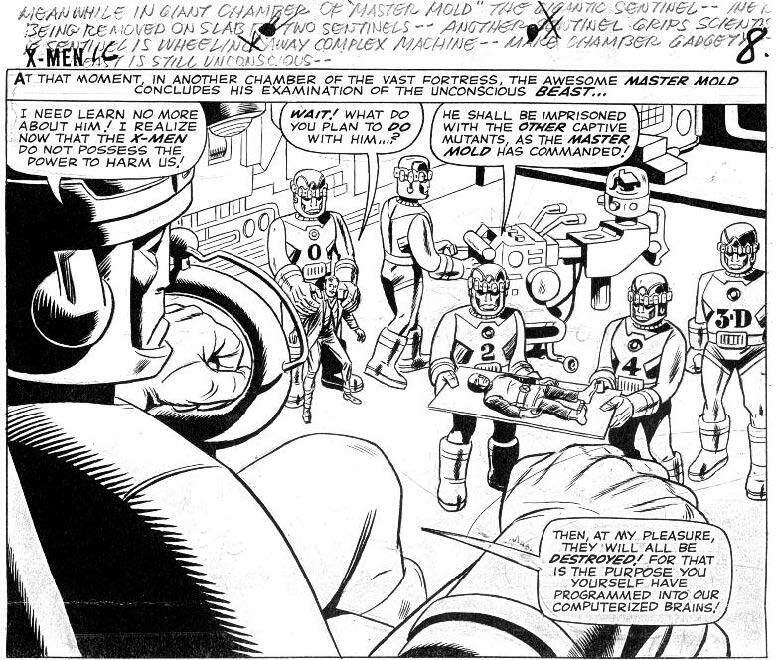 Soon after Kirby and Simon introduced the kid gang to comics, early in 1942, with The Boy Commandos and The Newsboy Legion, brought over from such popular films such as “Dead End” and Kirby’s own rough and tumble experience growing up on the Lower East Side of Manhattan, leading the way for Charles Biro and others to follow. 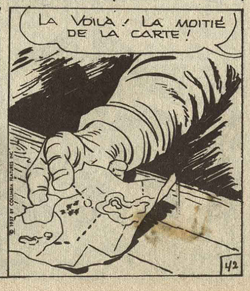 The kid gang would cross genres at Kirby’s hand in the early 50s with the Western Boys’ Ranch. 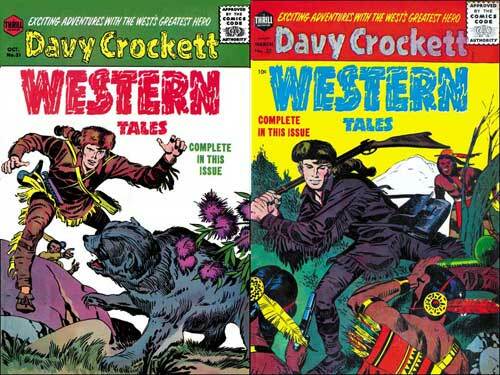 Western comics are a comic category Kirby did not create, along with the Crime comic (that credit goes to Biro), still his influence was felt on such titles as Bulls Eye, Black Rider, Gunsmoke Western, Two-Gun Kid, Rawhide Kid and Justice Traps the Guilty, Headline and Police Trap, respectively. 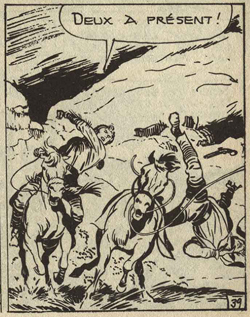 Indeed, Kirby often cited his favorite story as “Mother Delilah,” in issue number 3 of Boys’ Ranch. Remarkably it manages to cross no less than three genres, the Western and kid gang with the raw emotion and pathos of a Romance comic. 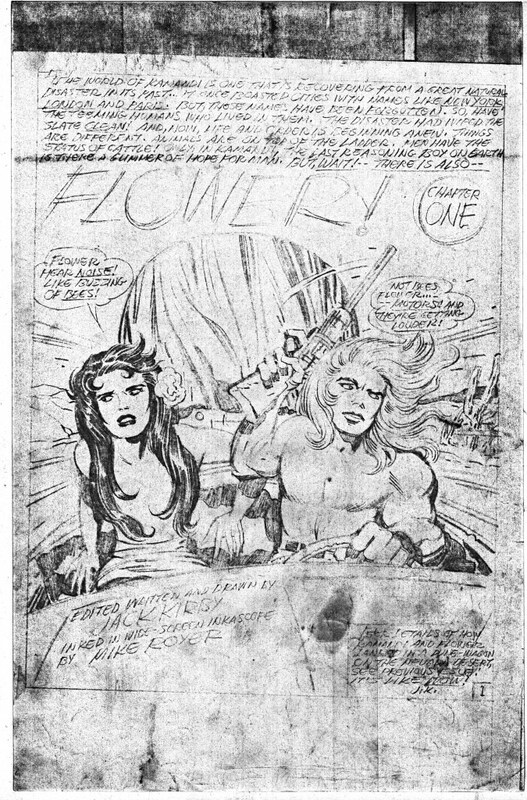 According to Simon and Kirby Studio historian Harry Mendryk, Kirby’s greatest output between 1947 and 1959 was in Romance comics, another genre the team created. 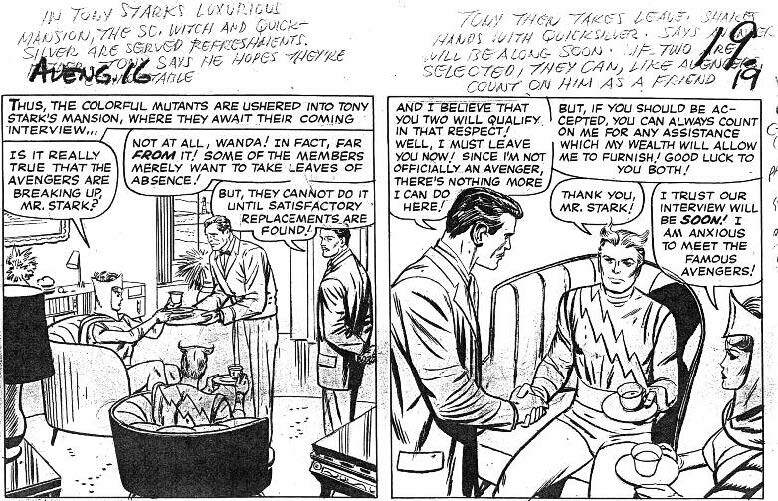 This dramatic breakthrough would become an intrinsic ingredient at Marvel in the early ’60s. 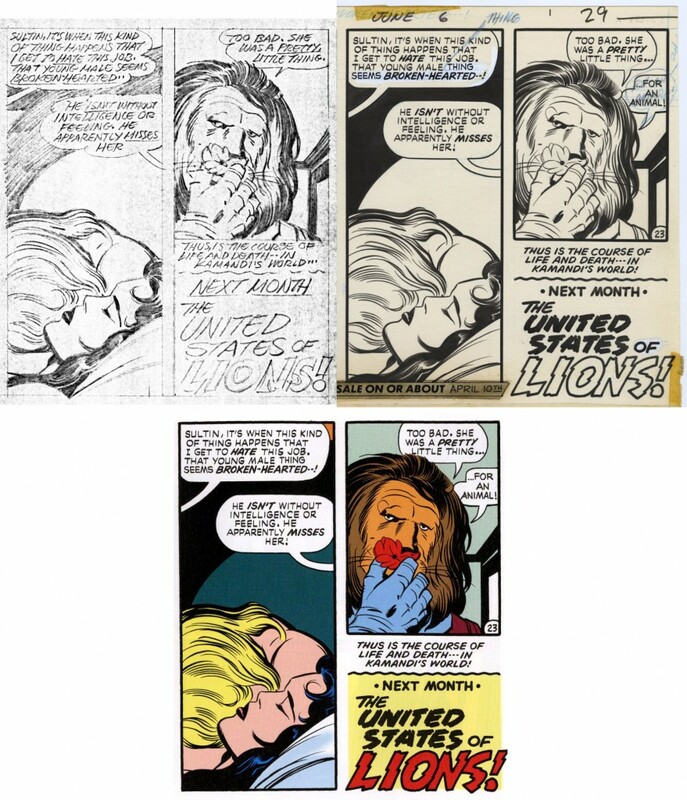 According to Hatfield, “It was under Kirby, though, that Marvel decisively latched onto the idea of unresolved, never-ending conflict between superpowered opposites, and revealingly, Kirby’s subsequent work often explores this kind of dualistic premise in distilled or exaggerated form. 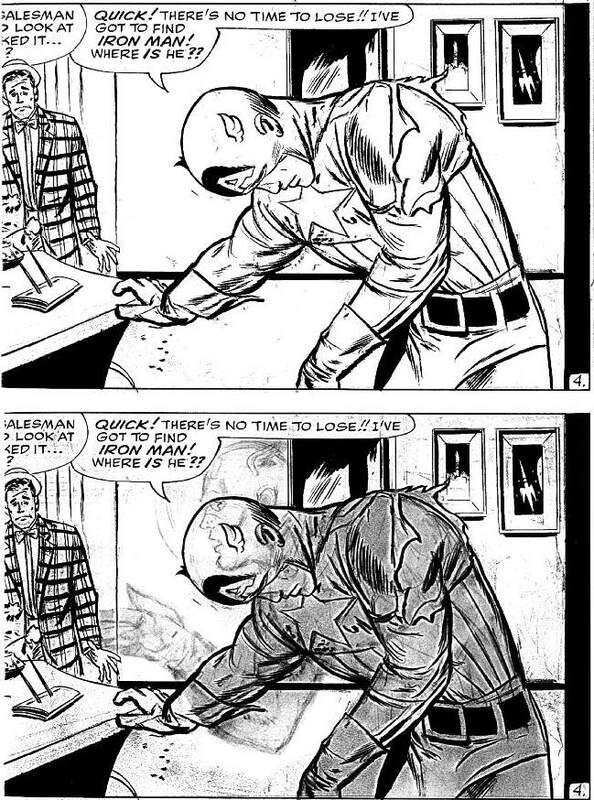 This sort of mirroring obviously appealed to him, as both a storyteller and a designer of characters. 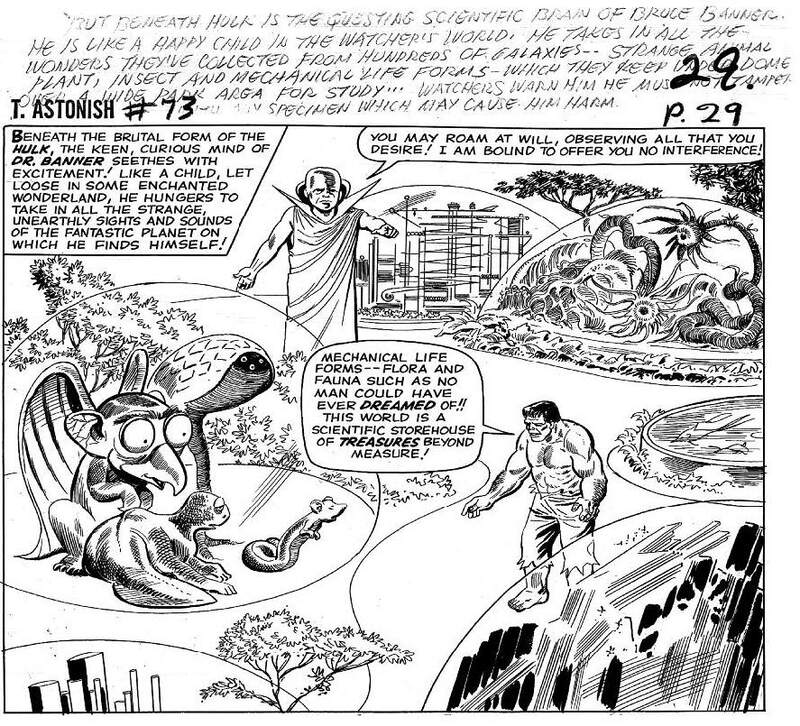 It was not Kirby who introduced mythological or cosmic elements to comics, rather it was the grand scale and sweep of these elements that resonated throughout the industry, beginning at Marvel and exploding the following decade in his Fourth World magnum opus. 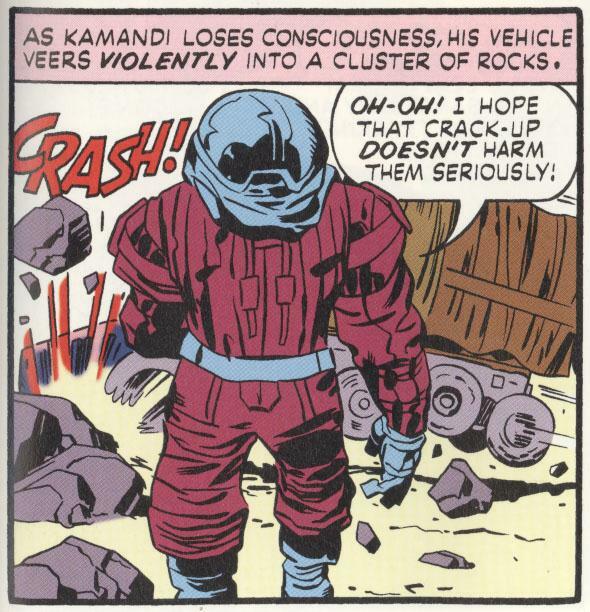 One example of divergent thinking is Kamandi: The Last Boy On Earth. 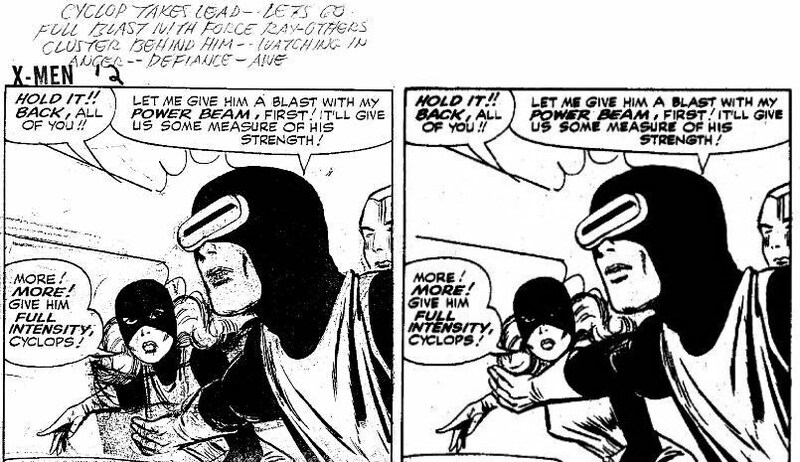 Reportedly suggested by publisher Carmine Infantino as a Planet of the Apes knockoff, Kirby riffed on the theme in such inventive ways as to render the source immaterial, as far a field as Charlie Parker’s bebop “Ornithology” is from the jazz standard “How High the Moon,” over which it is written. 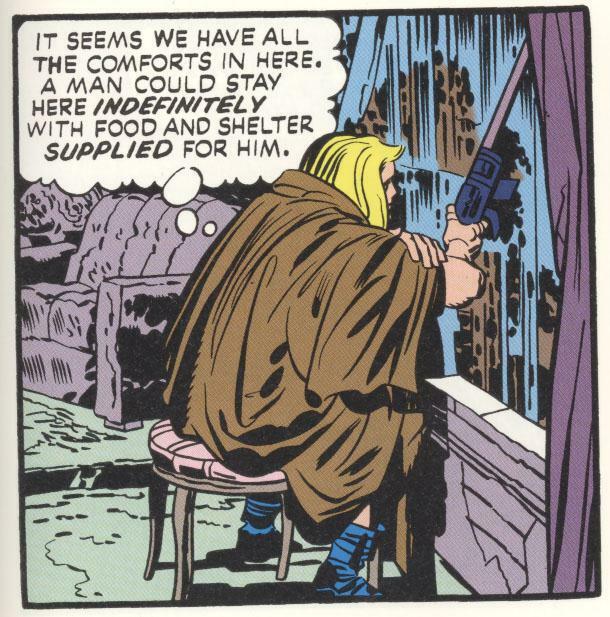 Kamandi lasted over 40 issues, Kirby’s second longest running title. He returned to Marvel in the mid-seventies and to earlier characters such as Captain America and Black Panther but also explored grander schemes once again in The Eternals and 2001: A Space Odyssey, based on Stanley Kubrick’s seminal film, used as a launching pad for an exploration of the human spirit and follies throughout history and into the future. Kirby left us in 1994. 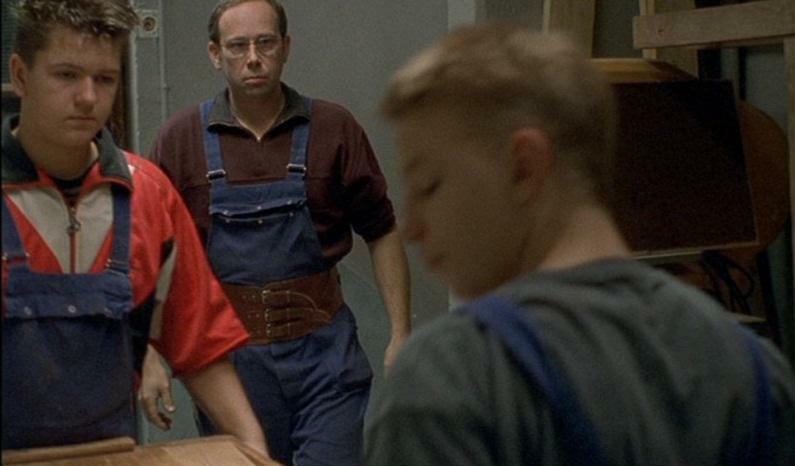 In the 21st century, with the advent of CGI, his creations have exploded onto the silver screen. Moviegoers who most likely would not recognize his name have spent billions worldwide to watch them in wide screen 3D. Kirby fits all the definitions of “creative genius:” someone who’s “creations are original,” who had “ability to grasp the world spontaneously,” who “represents the highest degree of giftedness but also is connected with the creation of qualitatively new works and with the discovery of previously unknown creative methods,” someone who’s “originality, creativity, and the ability to think and work in areas not previously explored” and finally as someone who left his unique mark in his particular field, and our culture as well. Special thanks to Norris Burroughs, Randolph Hoppe, and James Romberger for their help and guidance. 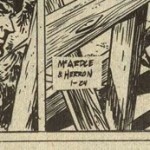 Comics Journal Interview #134, with Gary Groth, February 1990. The Critique of Judgment by Immanuel Kant, page 181. J. P. Guilford, Study of Human Intelligence, According to Guilford’s Structure of Intellect (SI) theory, an individual’s performance on intelligence tests can be traced back to the underlying mental abilities or factors of intelligence. SI theory comprises up to 150 different intellectual abilities organized along three dimensions—Operations, Content, and Products. Carl Jung, Psychological Types , 1921. Joy Paul Guilford, Study of Human Intelligence. American Psychological Association Monitor on Psychology, Considering Creativity, Dean Keith Simonton, University of California, Davis, Volume 34, No. 10 November 2003. Dr. Teresa Amabile, Professor of Business Administration in the Entrepreneurial Management Unit at Harvard Business School. Her 30 year research has studied how the work environment can influence creativity and motivation has yielded a theory of creativity and innovation. Creating Minds: An Anatomy Of Creativity As Seen Through The Lives Of Freud, Einstein, Picasso, Stravinsky, Eliot, Graham, And Gandhi by Howard Gardner, Basic Books, 1994. 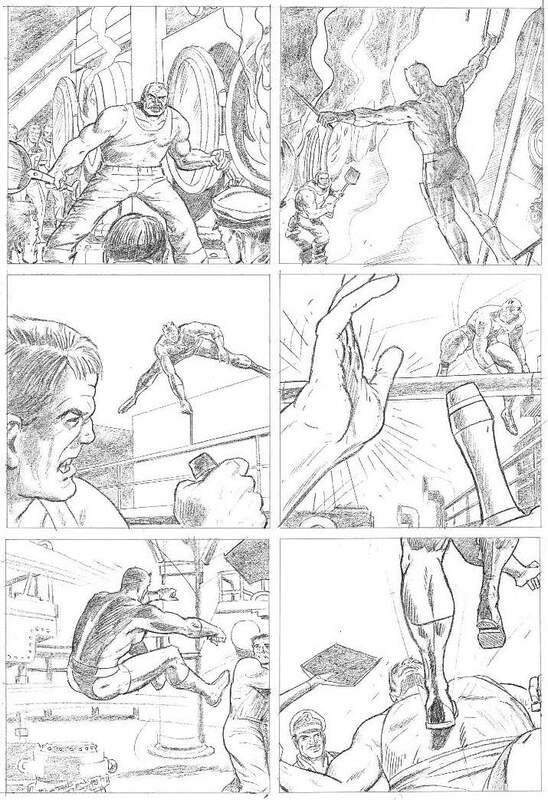 Men of Tomorrow: Geeks, Gangsters and the Birth of the Comic Book by Gerard Jones, pages 200-201. 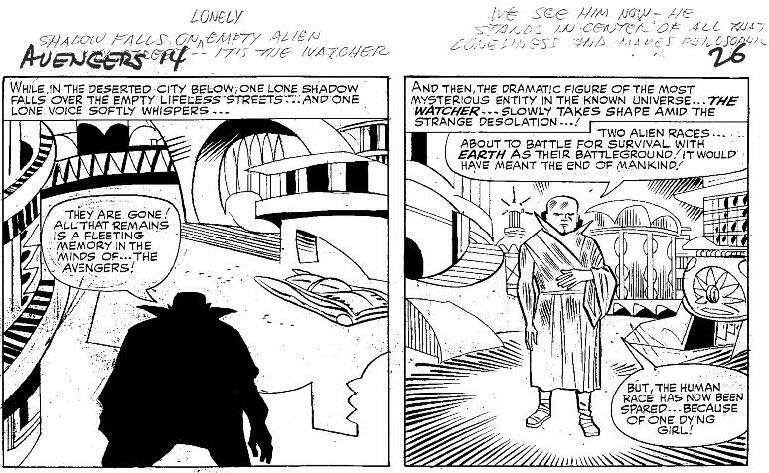 Kirby: King of Comics by Mark Evanier, page 60. Hand of Fire by Charles Hatfield, page 22. Hand of Fire, page 130. Alter Ego, Roy Thomas, editor, Bill Shelly and Jim Amash, co-editors, et al, TwoMorrows, Raleigh, NC. American Psychological Association Monitor on Psychology, Considering Creativity, Volume 34, No. 10 November 2003. Evanier, Mark, Kirby: King of Comics, Abrams, New York, NY, 2008. Gagne, Michel, Young Romance: The Best of Simon & Kirby’s Romance Comics, Fantagraphics, Seattle, WA, 2012. Gardner, Howard, Creating Minds: An Anatomy Of Creativity As Seen Through The Lives Of Freud, Einstein, Picasso, Stravinsky, Eliot, Graham, And Gandhi; Basic Books, New York, 1994. Great Soviet Encyclopedia, Macmillan, Inc., New York, NY, 1979. 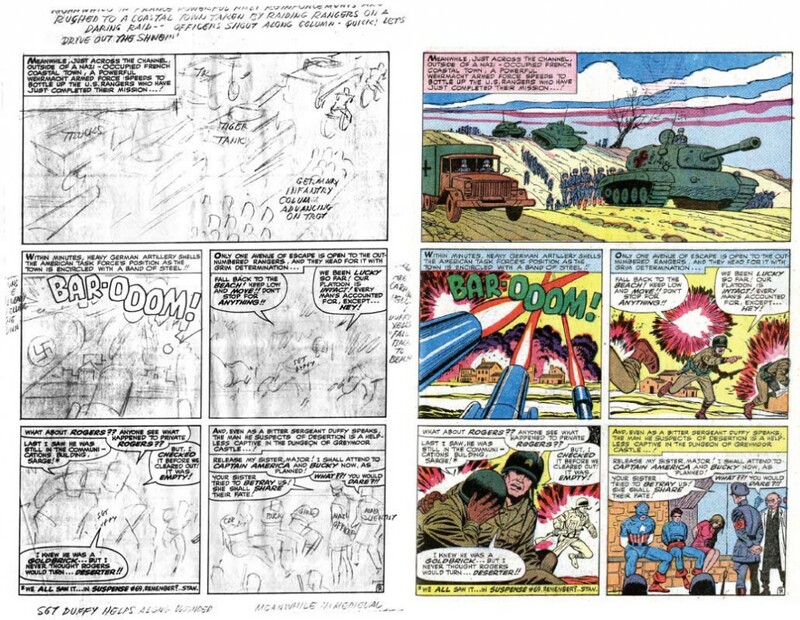 Hatfield, Charles, Hand of Fire: The Comics Art of Jack Kirby, University Press of Mississippi, 2011. Jack Kirby Quarterly, Chrissie Harper, editor, Quality Communications, London, UK. Jones, Gerard, Men of Tomorrow: Geeks, Gangsters and the Birth of the Comic Book, Basic Books, New York, 2004. Merriam-Webster’s Dictionary and Thesaurus, http://www.merriam-webster.com. 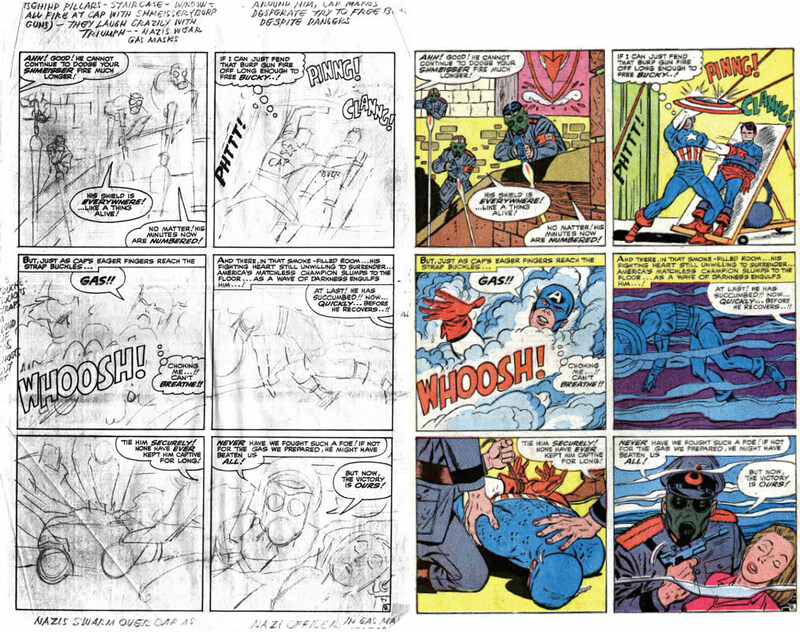 Theakston Greg, Comic Strip Kirby; The Complete Jack Kirby, volume 1–5; Jack Kirby Reader, volume 1–2, Pure Imagination, New York. The Comics Journal, Gary Groth, editor, Kim Thompson, Eric Reynolds, co-editors, et al, Seattle, WA. 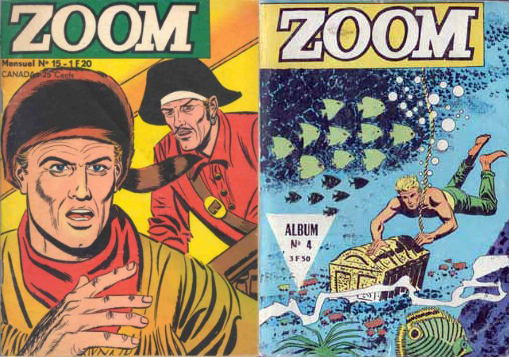 The Jack Kirby Collector, John Morrow, editor, TwoMorrows, Raleigh, NC. Thorpe, Scott, How to Think Like Einstein: Simple Ways to Break the Rules and Discover Your Hidden Genius; Sourcebooks, Inc, Naperville, IL, 2000. 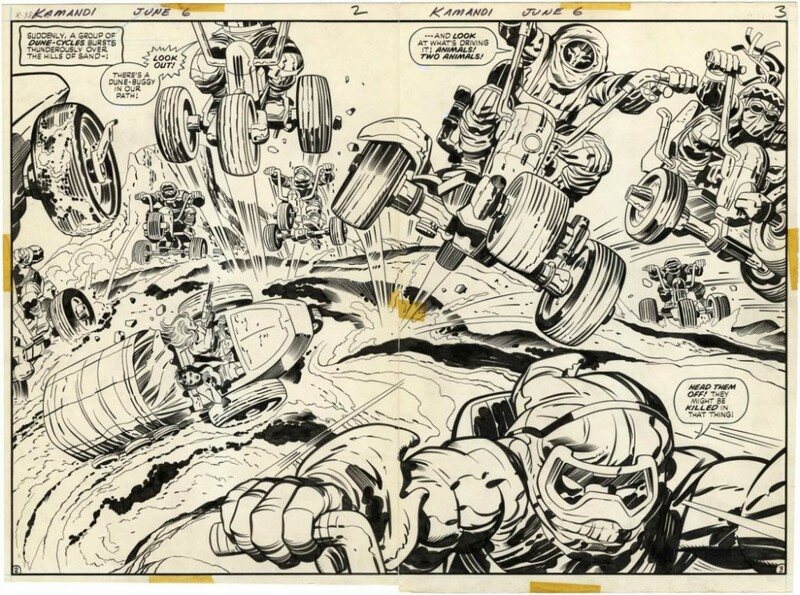 Wyman, Ray, The Art of Jack Kirby, The Blue Rose Press, Orange, CA 1994. Steven Brower is an award-winning former Creative Director for Print, a former art director at The New York Times and The Nation, co-author and designer of Woody Guthrie Artworks (Rizzoli, 2005), author of Satchmo: The Wonderful Art and World of Louis Armstrong (Abrams, 2009), and author of two books on Kirby associate Mort Meskin for Fantagraphics. He is on the faculty of Marywood University in Scranton, PA, and The School of Visual Arts in New York City. 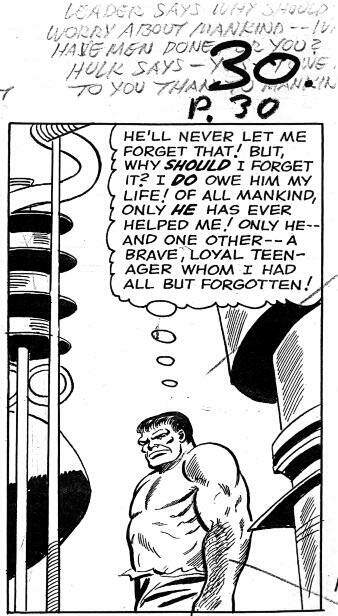 What an appropriate entry on what would have been Kirby’s 95th birthday! Thanks, Steven. — Rand. Posted 24 August 2012 in A Failure To Communicate, General.